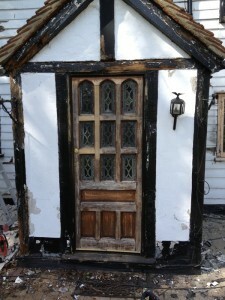 On a recent restoration project in Essex we encountered this very old, very fragile and VERY decayed door. 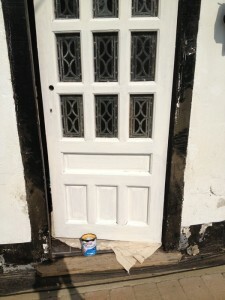 The door had decayed significantly. 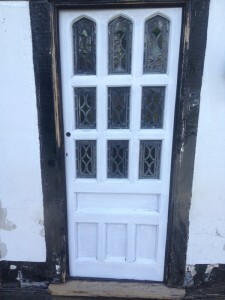 The door was made from solid oak but years of poor maintenance had left it in a sorry state, the new owners of the property had thought that costly replacement was the only solution. The door no longer opened, the joints had developed rot due to water ingress and it had begun to sag under it’s own weight causing it to catch the floor on opening. I was able to remove the bottom rail completely with just my hands! Before any repair work could be done, I thought it best to brace the door together with 6” stainless steel screws that would prevent it from collapsing. In the picture below the red lines indicate where the bracing screws were driven in to secure each rail in place. 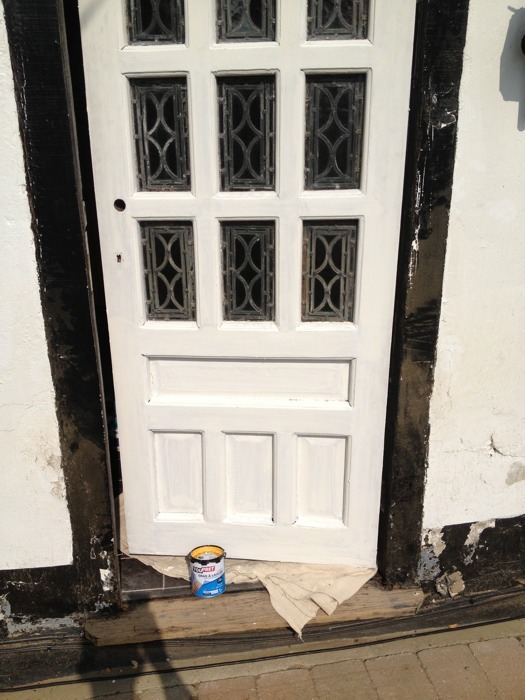 With the door secured (to a degree) all existing coatings were removed by sanding and every joint was opened up on the outside face with a router tool to a width of 6mm and reinforced with an elastic repair compound from Repair Care, the Dry Fix/Flex 4 system. These are known as conservation joints. 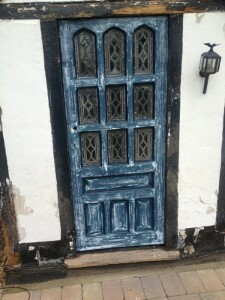 When the resin had cured in the joints the same process was repeated on the inside face of the door which rendered it solid and capable of performing the duties of a door once again. 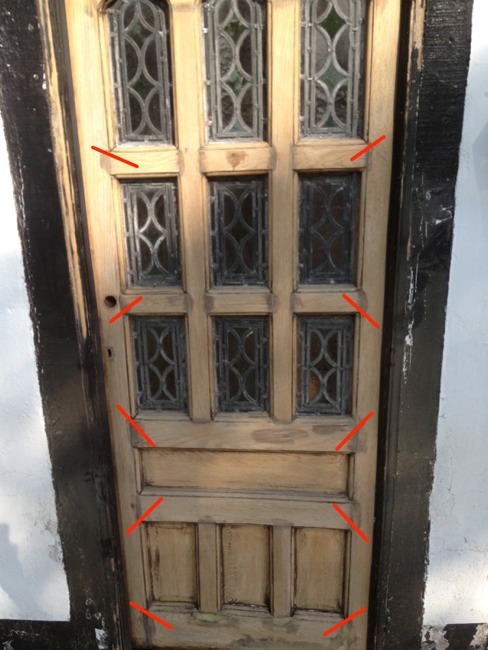 The door was braced together with large screws so that the joints could be cut open and reinforced. Now that the door was sturdy enough it was put on a bench, two inches removed from the bottom and rehung straight in the frame. 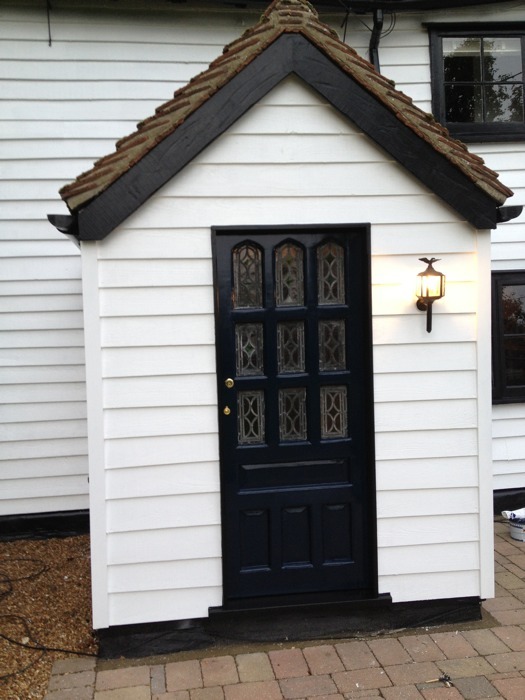 It was then painted with two full coats of Zinsser Coverstain, before receiving one full coat of Gras a Laquer, an oil based filler that achieves a super smooth surface. Due to the extensive repairs, clear or translucent finishes were no longer an option and our client agreed that an opaque eggshell finish would be much better. We went with three coats of Little Greene’s Traditional Oil Eggshell in colour Basalt, after the first coat it was skimmed again with Gras a Laquer for good measure. Two full coats of oil based primer. One full coat of oil based filler. A new hardwood threshold was installed two inches higher than the old rotten one to level up with the new height of the door, smashed lead light quarries were replaced, the panels sealed using Dry Seal MP and the porch was clad in timber before being painted with Jotun Demidekk. 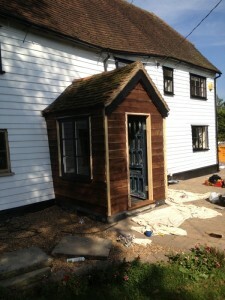 The porch was clad with timber reveals around doors and windows. Second coat of oil based filler applied. 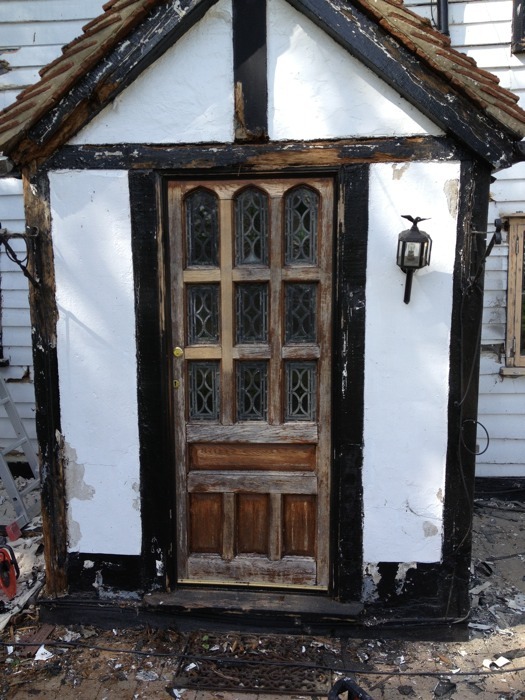 A lot of work, 7 coats of various materials! 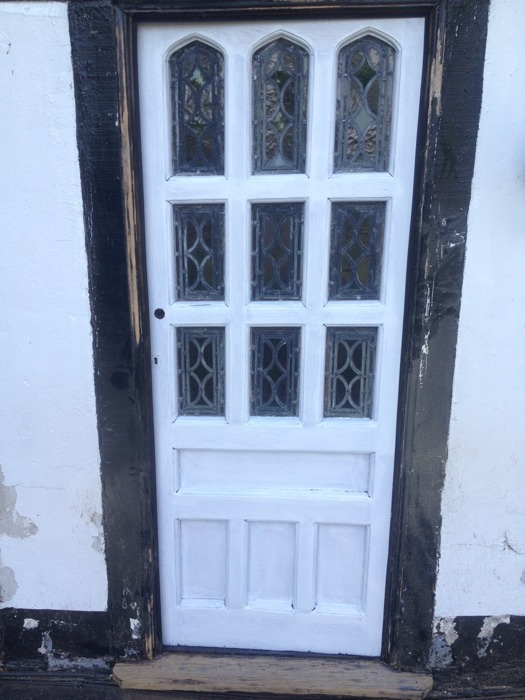 But the end result was worth all the effort, all for a fraction of the cost of replacing this unusual and distinctive door. If you have found this article informative or interesting then please subscribe to our blog by registering here.